Maida Heatter’s Palm Beach Brownies recipe is one of my favorites, but over the years I’ve played with it and am calling these “Updated Palm Beach Brownies”. 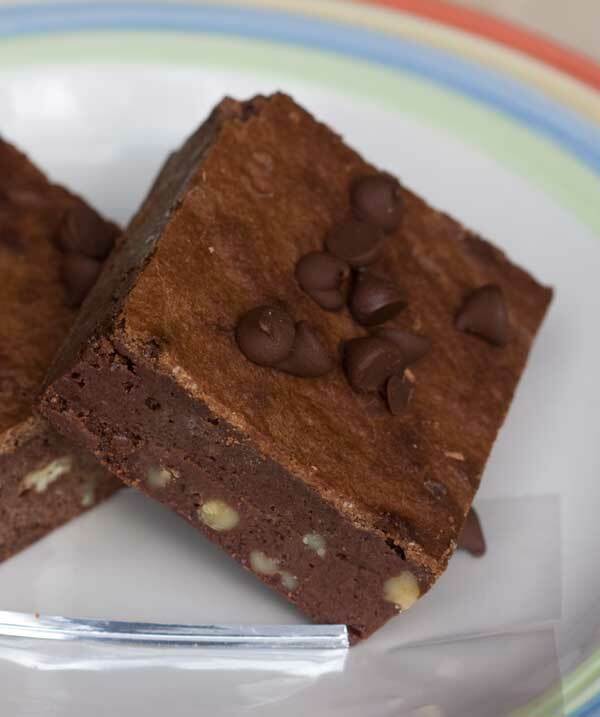 Like Maida’s original recipe, Updated Palm Beach Brownies are dense, stiff, and almost fudge like. In addition, they have a fairly noticeable crust thanks to the high heat baking. And even though there’s a lot of butter and chocolate, the brownies aren’t greasy — maybe because the high amount of eggs, flour and sugar balances it out. But even with all the sugar, they’re not overly sweet because the nuts cut the sweetness a bit (which is why I recommend leaving them in). Another good thing about Palm Beach Brownies is that they’re easy to cut into shapes. For instance, if you want to make football or cat head shaped brownies using a big cutter, these cut nicely when chilled. And I always chill these for as long as I can stand to wait! They’re better the next day, which leads us to the downside of these brownies. You need at least a day for them to sit and come into their own. The other downside is that if your oven runs hot or is in any way wonky, the brownies burn easily. They are supposed to be baked at 425 F for exactly 35 minutes and if you mess with the pan size or temperature (as I have done many times), you’ll get different results. These days I stick with this recipe as written below, plus I add in the step of plunging the brownies into a pan of ice water as soon as they’re baked. So here’s how I’ve been making the brownies lately. I don’t like messing with the original make-up of the major ingredients (the 8 oz butter, 8 oz chocolate, massive amount of sugar), but I’ve been trying different brands of chocolate and butter and using evaporated cane juice crystals in place of granulated sugar. 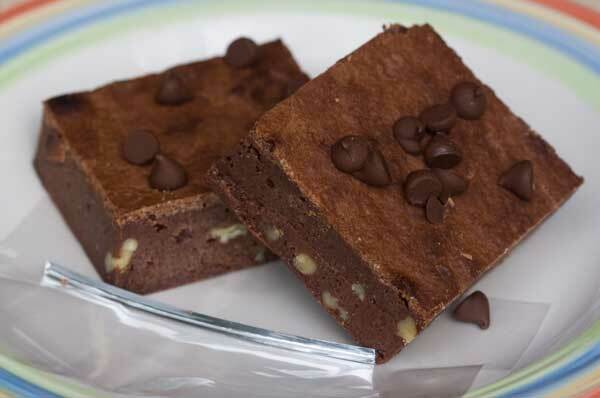 Thick, Crusty, Fudge Brownies that are on the sweet side, but still good. The original recipe is from Maida Heatter, who used espresso powder and a mix of almond and vanilla extracts. Adjust an oven rack one-third up from the bottom and preheat oven to 425 degrees. Line a 9x13x2-inch metal pan with nonstick foil or parchment paper. Melt the butter and chocolate together in a saucepan set over low heat or in a microwave-safe bowl, using 50% power and stirring every 30 seconds. In the bowl of a stand mixer fitted with a whisk, beat the eggs with the vanilla, salt, coffee and sugar at high speed for 10 minutes. On low speed, add the chocolate mixture and beat only until mixed. Stir in the flour using lowest speed of mixer, then remove from mixer and stir in the nuts. Pour the batter into the prepared pan. Bake for 35 minutes, reversing the pan from front to back once to ensure even baking. Halfway though, lay a sheet of heavy duty foil over the top of the brownies to prevent the top from burning. At about 25 minutes the brownies will start to smell really good and you might be tempted to take them out, but try to hold out and keep them in the whole 35 minutes. If your oven is calibrated properly, you won’t overbake them. While brownies are baking, fill a roasting pan about an inch full with ice water. Remove the pan from the oven, scatter chips across the top (if using) and immediately set pan in the ice water. Let the brownies cool down in the ice water bath for about 30 minutes, then transfer to the refrigerator or the freezer and chill overnight. The next day lift the brownies from the pan and peel away the parchment paper or the foil. Cut into large squares. This recipe is adapted from one by Maida Heatter. For an 8 inch pan (half batch), bake for only 27 minutes, then plunge pan into a larger pan with ice water to quick cool. Refrigerate brownies for several hours or overnight, then lift by grasping foil. Cut into squares. 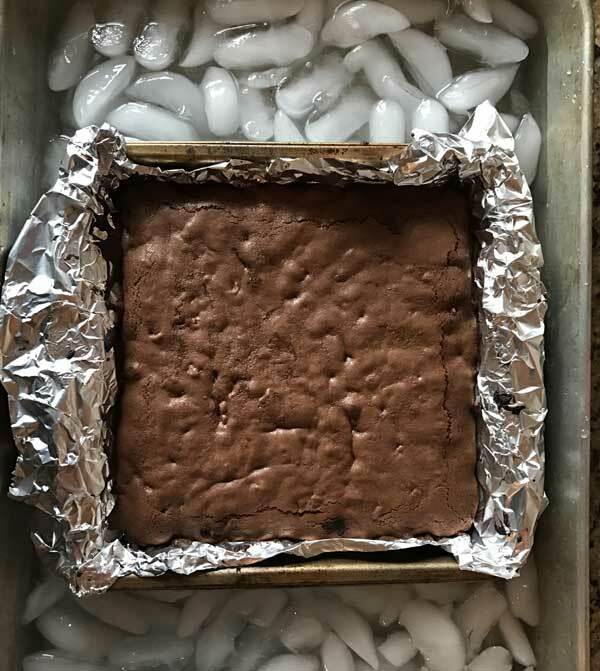 I've never made these in a glass pan, but if you try it, make sure to reduce the temperature by 25 degrees F. I think using a glass pan might give the brownies a thicker crust. Also, cutting them into 24 pieces or 16 pieces is a suggestion. These are dense and heavy, so you may be satisfied with 1/48 or even smaller. Katrina, I like the flavor evaporated cane juice crystals. It has a tiny hint of molasses, but lacks the extra moisture that brown sugar has. Good luck playing around with the recipe! Halving it works, you just have to nail down the perfect time and temp. I haven’t made a new brownie for a while. Mmm. Why do you use evap cane juice for these? I consider organic cane sugar a splurge for me and use it now and then, I might try a half batch of these and use a gluten free flour. Thanks for all the guidance, Anna. I hadn’t thought about my brownie pan size, will have to check if it’s a nine inch. I think I will do the while batch and should not have any problems finding some neighbors or friends to taste-test the rest. To be safe, you may want to splurge and make a full batch and then freeze whatever is left. That way you’ll get an idea of how the brownies are supposed to be before you halve the recipe. However, I totally understand why you’d want to halve the recipe given the size of it and all the expensive ingredients. I’ve halved it in the past by using 2 whole eggs and 2 tablespoons of lightly beaten egg. Also, make sure you use an 8 inch metal pan rather than a 9 inch. If you use a 9 inch square, you’ll need to reduce the baking time even more AND the brownies will be thinner and might be overdone. With the 8 inch pan, baking time should be about 22 minutes (at 425F). I’ve also baked in an 8 inch pan at 400 F for about 30 minutes. The most important thing is to be patient, let the brownies cool, chill, and sit. They may seem underdone at first, but they should be fine once they’ve cooled and chilled. 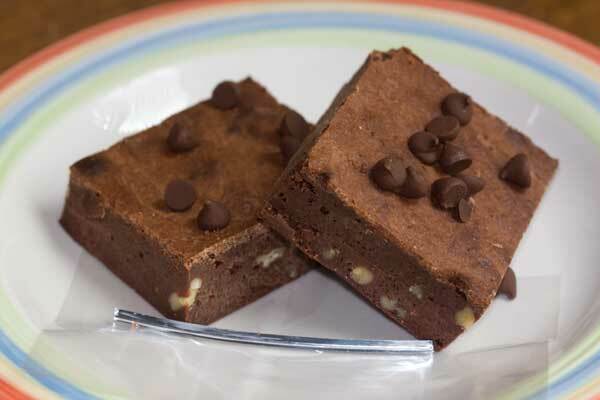 These look amazing, just the kind of brownie I like. If I was going to halve the recipe, how many eggs would I use? This looks soooo good. OMG thanks for sharing, can’t wait to try. Wish my mouth was not watering at 1:45 a.m.!!! These look amazing!! That is a lot of sugar, but I suppose using unsweetened chocolate is partially the cause. Do you think I could use salted butter and just leave out the salt? Amy, Carol, and Karen — thanks for the comments! Let me know what you think if you try them. I weighed one today and it came it at about 4 oz. I am not sure it was exactly 1/24th, but it was a very heavy, smooth textured, dense fudge brownie. Oh my, these look delicious. Before I read your description I was seeing the crusty top and the fudgy middle. Kind of reminds me of my mom’s brownies, although hers are not quite so rich. Anna-these look great. I made your Bakery style brownies a few weeks ago and I have been craving them ever since. The other thing I should mention is that a 1/24 serving is a really dense and heavy brownie. 1/24 or even 1/16 a fun size to wrap and sell at bake sales, but I usually eat 1/48 or less because they are so dense. They are like fudge, but not as cloyingly sweet. A little goes a long way! Darlene, I usually let mine sit out for about 10 or 20 minutes so that its cool but not ice cold. I love a recipe written with such precise details as this one – increases the likelihood that we’ll have success with it also. Thanks a million, Anna, for taking the time to figure it out for us. Are they best served once they’ve come to room temperature, or do you like them cold from the refrigerator?